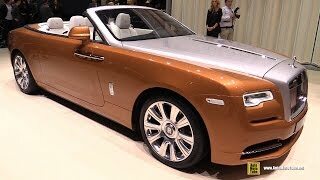 The 2015 Frankfurt Motor Show added stars to the Rolls Royce Wraith by unveiling the convertible version, Rolls Royce Dawn 2016. 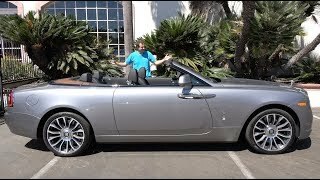 Looking initially at the details shared by the company, the model seems to be quite a ‘heartthrob’ and the expectations from the Rolls Royce make it bump a little more loudly. 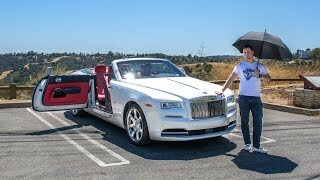 Let us have a look at the review of Rolls Royce Dawn 2016 to know exactly what this beauty is all about. The interior of Rolls Royce Dawn 2016 as expected hold its roots in its sibling. However there are few changes that make it more special and adorable. In this queue for me in particular is the Starlight Headliner and the 1,340 individual lights adding gleam to the roof liner. The sight is worth a gaze, and being precise believe me; you won’t like to step out of the arena. There is enough of space inside the model and that makes it comfortable as a four seater model. Being frank this convertible in particular from my perspective has changed the norms of the segment. The dual-tone interior and the black three-spoke steering wheel with those lights over your head make the cabin a preferable place to stay. In all the interior of Rolls Royce Dawn 2016 is simply amazing, offering you lots and lots of space and luxury. 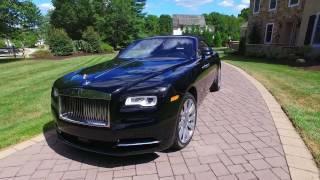 Unlike interior, exterior of Rolls Royce Dawn 2016 carries several distinct features that make it stand ahead in its segment. Starting with the front fascia, model brings a revised grille which sits above an extended bumper (almost 2.1 inches) and new headlamps. Along the sides Rolls Royce Dawn looks highly impressive with its decent look. The two door convertible features surprisingly shining body in blue that gets contrasted with its interior tone. Moving towards the rear end, massive tail lights sit at both the corners of deck while the body-colored bumper looks quite elegant with its design. The roof made from metal; the one we noticed in the sibling of Rolls Royce Dawn gets replaced by a six-layer canvas top and gets retracted and stored in the space behind the rear seats. Beneath the hood of Rolls Royce Dawn 2016 is a powerful 6.6 liter V12 engine generating total output of 563 hp and peak torque of 780 nm mated to ZF eight-speed automatic transmission. 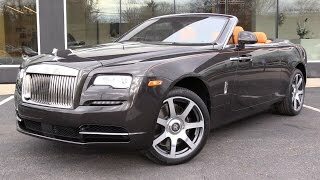 With this power rolling its 21” massive wheels, the top speed of Rolls Royce Dawn 2016 touches mark of 155 mph and the 0-62 mph sprint can be knocked in just 4.9 seconds.